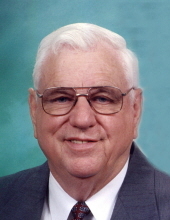 Mr. Harold D. Nobles, 86, died Friday April 12, 2019. The funeral service will be conducted on Monday at 2 pm in the Wilkerson Funeral Chapel. Burial will follow in Pinewood Memorial Park with Masonic Rites. Mr. Nobles was a lifelong resident of Pitt County, graduated from Winterville High School. He was a veteran of the United States Air Force. A former employee of Garner-Wynne Manning Inc. for 20 years and also with Burroughs Welcome for 17 years. He was a member of the Ayden Masonic Lodge #498 A.F. and A.M. and Scottish Rite Bodies and a Shriner. In 2018 he received an award for the Pitt Shriner of the year and a member Pitt County Shrine Club. A member of the Rose Hill Free Will Baptist Church and served as an usher and active in the Laymen League. Harold was a devoted Pirate Fan enjoying, basketball and football events. Harold enjoyed traveling with his family and extended family to Myrtle Beach and Pennsylvania and ECU sporting events. He was preceded in death by his sisters, Margie Williams, Effie Hathaway and Lucille Hines; a brother, Jasper Nobles. The family will receive friends on Sunday from 6 – 8 pm at Wilkerson Funeral Home. Memorials may be made to Rose Hill Free Will Baptist Church, 6236 County Home Road, Winterville, NC 28590 or Shriners Crippled Children, 403 E. Front St., New Bern, NC 28560. To send flowers or a remembrance gift to the family of Harold D. Nobles, please visit our Tribute Store. "Email Address" would like to share the life celebration of Harold D. Nobles. Click on the "link" to go to share a favorite memory or leave a condolence message for the family.